Land mines are one of our biggest problems here. You know how children are. You tell them to stay on the path, but it is so hard for them to realize the danger and obey. Just for them to go to help find some firewood or go to school, it is so dangerous. One was badly injured and we took him to the hospital in San Pablo, and they said they could not treat him there. Then we had to take him to Bucaramanga, all at our expense. There doesn't seem to be any help from the government," shared one of the farmers. Delcy, from the Vice President's Office of Human Rights, answered, "If they cannot treat a person in San Pablo, they are responsible for transporting him to where he can be treated. I will have that looked into." Another farmer shared, "The Army treats us like dirt. They have check points on the paths to our fields, and they stop us and accuse us of being guerrillas and detain us for hours at a time. They entice our children with candy and then try to pump them for information. Is that legal? Sometimes people just disappear and are never heard from again"
Delcy answered again, "I am sorry to say they can detain persons for 36 hours legally. If the Army is doing things illegally, write down exactly what it is and their battalion, names, rank, etc…and when and where as quickly as possible. Use your cell phones to call the Defensor, me, or any government agency you have access to, and we will contact who is in charge of the battalion to change whatever they are doing wrong." Another farmer responded, "Many times they won't tell us what battalion they are part of, or they come without shirts that identify who they are. At times the illegal paramilitaries, the "Black Eagles," are part of the Army too. Last week when the army was manually pulling up coca plants, two homes were burned down. Things are horrible here." Delcy responded. "Then just give us as much information as you can as soon as possible. The sooner you let us know, the more effectively we can use this to stop illegal things from happening and prevent more bad things." "Another big problem here is the government spraying of our coca fields with extra strength Roundup (cocaine is made from coca leaves). Often they miss their mark, and we lose our food crops, or they hit the springs that are our water supplies, or our corrals of our cows or mules. And when they miss, the government says they will reimburse us for any damages, but they never do," shared another farmer. The Defensor (the government agent for human rights) responded, " Get me the information as to when and where these mistakes happened, and I will inform the authorities whose job it is to investigate and pay you for the damages. If they don't do it in a timely manner, I will have the information and pressure for an investigation myself." This was part of two meetings with various farm communities to share their plight with a commission. We were accompanying them as a way of providing the meetings and the commission with security. These are some of the various agencies which made up the commission: The Program for Peace and Development, The Organization of American States, the regional Mayor's Office, and several human rights and refugee agencies. Some thought perhaps 50 families would soon abandon their homes unless something changes. The travel to these communities was a horrendous, dusty, three hour (one way) trip through creeks and over football sized rocks and holes and up and down mountains on the back of a small one ton truck. On the one trip the truck was so full that two fellows rode on top of the cab. I even developed an open sore from sitting on just a board as a seat. The one village was named Paradise; I felt we had to go through hell to get to Paradise. Despite the rough travel, I am thankful to be able to be supportive to these people. Thank you for your part in enabling me to do the trip. Wouldn't it be great if the million dollars a day we give in military aid to Colombia were used for roads instead? Here is a link to some more pictures of this trip: http://www.plowcreek.org/paradise-photos.htm These pictures will really give you a good idea of the remoteness of the area and how these people live. Pray for peace and security for Paradise and the other communities. Pray that the paramilitaries, guerrillas, and Army would see the light: that violence does not work. "I lost my dad, two uncles and a brother to the armed groups. My dad just disappeared; we never saw him again." On the trip he pointed out once, "Those guys in the truck that just passed us were paramilitaries." 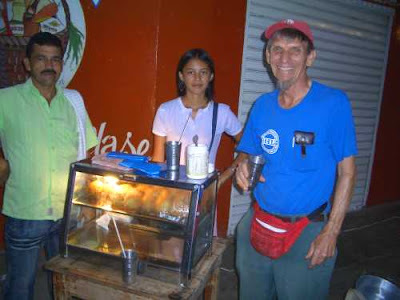 The woman in the picture is the food vendor.